KOTA BARU: The government wants more supermarkets, retail outlets and hotels throughout the country to join the Malaysian Food Bank programme to help feed needy people. Deputy Prime Minister Datuk Seri Dr Wan Azizah Wan Ismail said the programme is being implemented in two phases, beginning with a pilot project which began in August until December this year. 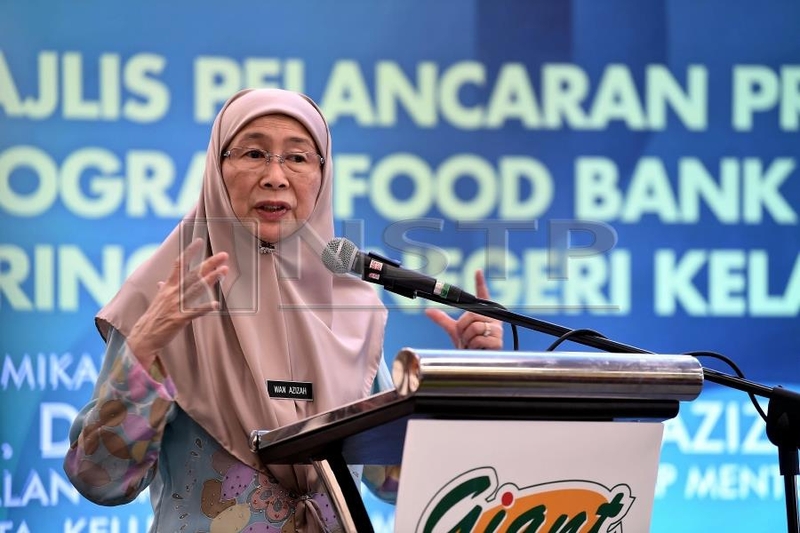 “The second phase which will cover the whole country is expected to begin in January next year,” she said at the launch of the Food Bank Malaysia Programme Pioneer Project, Kelantan-level here today. Also present Domestic Trade and Consumer Affairs Minister ​​​​​​​Datuk Seri Saifuddin Nasution Ismail. Wan Azizah said the objective of the programme was to tackle the problem of food wastage and reduce operation costs of supermarkets. “The government is very concerned about reducing the cost of living of the people especially the needy who are at poverty level. “This group must be given assistance to gain access to food supply as it would lighten their burden and save their food costs, and the money could be used for more important things,” she said. ​​​​​​​She added that the target group for this programme were households with a monthly income of less than RM930.